Fr. Christophe again discusses the sexual addiction, this time focusing on masturbation. All the angels are amazed at thy mercy, O Lord, for thou hast given to sinful mankind a strong defender and helper. She sees our weakness and delivers us from the bitter disease of drunkenness and other addictions, teaching the faithful to sing to God: Alleluia! Fr. Christophe again discusses the sexual addiction, this time focusing on Romans 1 and its injunction against the separation of soul and body. Seeking to thank thee, O Sovereign Lady, a certain man healed from his passion for alcohol in gratitude adorned thy miraculous icon that is in Serpukhov, singing to God from the depths of his heart: Alleluia! Treating the relationship illness co-dependency, mother of addictions. Though beset by a storm of doubting thoughts, those bound by passions and addictions come with sincere repentance to thine inexpressible mercy to receive healing, singing from the depths of their hearts to our Savior, born of thee: Alleluia. Fr. Christophe outlines the first three steps of a 12-step fellowship, explaining that our affliction is an invitation to heal. 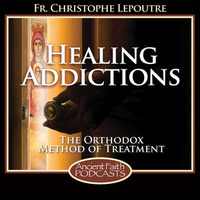 I will begin this podcast with the prayers from the Akathist to the Mother of God known as the Inexhaustible Cup. Fr. Christophe uses the story of the Woman at the Well to explain how it is that the Lord brings forth healing within the Orthodox Church. Kontakion 2, Ikos 2: In the name of the Father and the Son and the Holy Spirit. Amen. Fr. Christophe introduces his podcast and then discusses the appetitive function.